The Music Hall offers a number of features and services to increase accessibility. Dallas Summer Musicals (DSM) is the preeminent nonprofit presenter of Broadway theatre in North Texas. DSM produces, presents and promotes excellence in live musical theatre with year-round performances for diverse audiences of all ages, impacting the lives of children and families through community outreach and education and enriching the cultural landscape of Dallas/Fort Worth, North Texas and the Southwest Region. Wheelchair seating is offered at all price levels and based on availability. View or call for availability for a specific performance by visiting the ticket information page. Barrier-Free Walk-Ways: On-grade entrances, elevators, railings, and wide doorways are used for your convenience. 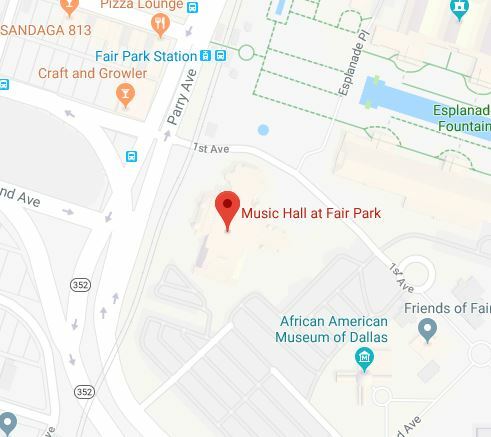 Designated Parking: ADA parking is allocated throughout Fair Park and in the parking lots typically frequented by Music Hall patrons. Well-attended performances may also feature ADA accessible trams for added convenience. Main Floor Restrooms: Private ADA accessible restrooms are located on either side of the auditorium on the orchestra level of the Music Hall. Crystal Terrace (on-site restaurant) features wheelchair accessible bar and table space. Click for more information or to make a reservation. Wheelchair Provisions: A limited number of wheelchairs are available for on-site loan free of charge and on a first-come-first-served basis. Please speak with an usher upon arrival or call 214-691-7200 ext. 0. ASL-Interpretation: Select performances of Broadway shows feature ASL interpreters and will be noted on the production’s performance schedule. The location of the interpreter can vary, but they are typically located immediately in front of the stage on the right side of the auditorium when facing the stage. Call 214-691-7200 ext. 0 or email customerservice@dallassummermusicals.org with questions. Listening headsets are available for rental on a first-come-first-served basis in the west lobby between aisles five and six. A major credit card or driver’s license is required as collateral. Please arrive at the rental counter at least 30 minutes prior to curtain to avoid disappointment. Hearing Assistance: The Music Hall offers equipment/assistance for patrons wishing to use headsets, T-Loop, streamers, or “Classroom Compatible” Devices. Patrons can experience the superior quality of the Hear Us Now (™) enhanced listening system. The hearing assist counter is in the west lobby between aisles five and six. A major credit card or driver’s license is required as collateral. Please arrive at the rental counter at last 30 minutes prior to curtain.